Whether you’re searching for that gorgeous resort for a family trip to the Bahamas, need a budget friendly hotel in the suburbs of New York City for a last minute getaway, or seeking 5-star accommodations in Rome, trivago has you covered. Trivago allows travelers to easily search hotels anywhere in the world at the lowest rate. All you need to do is enter where you want to go, include the desired travel dates and allow the search engine to compare prices. You can further narrow your search by choosing to filter by price, distance (to the beach or city center, for example), rating and more. In addition, the site has over 175 million hotel ratings and more than 19 million images, so you can even see the view from your potential room. Another unique feature of trivago is that you don’t book your hotel on the trivago website. While trivago provides the user with a great deal of hotel information, the actual booking process is completed on other sites. 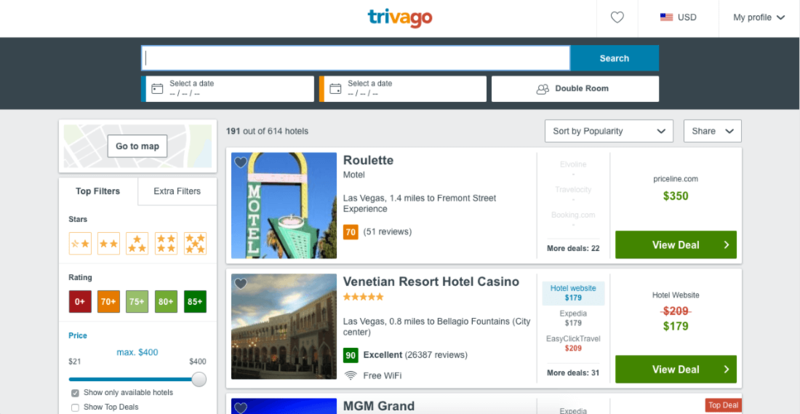 Once a hotel is selected, a user can click on the ‘View Deal’ button where he or she can complete the hotel reservation, based on the information found on trivago. The idea of trivago came about in Düsseldorf, Germany in 2005 by three graduate school friends, Rolf Schrömgens, Peter Vinnemeier and Stephan Stubner. In 2006, Stubner left the company and Malte Siewert, another graduate school friend, joined the founding team. A website that began in a garage in Germany with three people now employs over 3,000 people and operates in 55 markets around the world. And the free trivago mobile app is available to everyone. “As a truly global company, trivago is available via desktop, tablet and smartphone at any time and nearly anywhere in the world,” stated Eichelberger. The company gets roughly 1.4 billion annual visits to their site, and has become a top destination for travelers when it comes to booking that perfect hotel. In addition to helping travelers find their ideal place to spend the night, trivago also provides a free service to hotel managers, encouraging them to update their free profiles to help drive guests to their hotels. This ensures that website content always stays updated and fresh. Furthermore, the trivago team produces a unique blog, which they call Room5. This offers great inspiration (and motivation) to take that next trip (not to mention enticing pictures that will make you want to book your next trip…immediately). Trivago is a great site for any traveler to keep in their back pocket. “If you’re on a business trip in Dubai, the moment your plane lands, you can visit the trivago app and book a hotel before you even claim your bags,” explained Eichelberger. “So whether you’re planning in advance or on a last minute detour for business, you’ll always find somewhere to spend the night.” With trivago, there’s always a place to stay.